Being a small business owner can be both rewarding and extremely stressful. When it comes to running a business, some stressors can be more damaging than others, and when it becomes too overwhelming, those stressors can break the business model. While there are endless sources of stress that could potentially impact how someone reacts to their role as an entrepreneur, some are more prevalent than others. 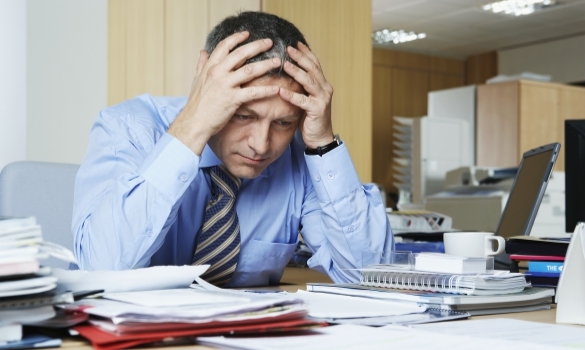 Here are four of the most common stressors for small business owners, and how to overcome them. One of the main challenges, and subsequently a significant source of stress for small business owners is getting stuck in the day-to-day work of running a business. It’s all too easy to get sucked into the daily tasks rather than looking at the bigger picture. Things like administrative duties can eat up a lot of time, so even if you have intentions of growing your business, there are only so many hours in a day. Delegate, outsource, and use business tools to take the load off your back and reduce your stress. Humanity is an innovative program that can handle scheduling for you. Paying a student or virtual assistant to catch up on filing and data entry can free up time. Getting away from your workspace and putting your phone on silent can help you focus on the tasks you need to complete to make your business successful. One of the main draws of business ownership is having the ability to set your own hours and add flexibility to your schedule. In many cases, you can get out of work and attend your child’s sporting event when you wouldn’t otherwise be able to. You might be able to take a day off and spend time with a friend in need at a moment’s notice. However, you make up that time later and often work harder than anyone else. As a business owner, you need to take it upon yourself to set business hours using time management strategies. After a certain point in time, you will not check emails or head to the office until the next day. Not only can this reduce your stress of working all the time, it will also have an overall positive impact on your relationship with your family or spouse. It also guarantees that you have time for self-care practices and socialization. While job security may be a bit of a myth, there’s no feeling of comfort like knowing you have a regular paycheck coming to pay your bills and feed your family. When you’re an entrepreneur, that’s not always the case. There may be ebbs and flows in your business that greatly impacts how much money you take home. You may even have to find a small or no interest loan to keep your business running at times. Additionally, many entrepreneurs don’t take a traditional paycheck, and just draw money from the business as needed. There’s nothing to do about the way money comes in except to work hard to grow your business. You can, however, impact how money leaves your business. Having a well-planned operating budget will guide you when it comes to cuts and spending. Adhering to that budget and keeping your financials up-to-date will give you a real-time picture of how your business is performing, and make things easier at tax time. Be responsible when you spend and when you borrow. Small business owners usually build a business around one of their passions. They dream of getting into a certain line of work so they can spend every day doing what they love the most. Unfortunately, the reality often looks much different than the dream scenario. That being said, when things get hard, it’s important to stop and remember your passion. Sure, opening a bakery might not be the best way to celebrate your love of pie, but put things in perspective: you could be working to make someone else’s dreams come true rather than yours. Regret and self-doubt are a significant stressor for entrepreneurs. When you don’t feel like seeing something through to completion, remember why you got started in the first place.